Colin Magness explained his multiple character portrayals, time traveling and his experiences selling gas masks. Wandering down Liacouras Walk on Wednesday, Nov. 10, one may have had the unique opportunity to meet a gas mask-selling wizard wearing a mask made from cast hands and writing on a white board amid a trunk full of gas masks. The mysterious gas mask man is Colin Magness, a Tyler student working toward his B.F.A. in “dust collecting” – sculpture and ceramics – who defines himself as a time-traveling, alchemy-practicing wizard. His Main Campus setup was part of a week-long performance piece. According to Magness, whose wizard name is SsengamNiloc, everyone is a wizard, but whether an individual chooses to acknowledge this wizardry is an option. Time traveling, however, comes as a separate skill Magness developed using meditation and what he calls the “true time machine” – the human mind. Magness’ gas mask-selling business came to him by coincidence. His friend and fellow sculpture major, Cody Griswold saw a Craigslist advertisement for gas masks. Later, Magness and Griswold found themselves in a warehouse near Indiana Avenue filled with gas masks, which, the artists soon learned, were to be demolished. ABI REIMOLD TTN Art student Colin Magness continues trying to sell 700 gas masks on Liacouras Walk the week of Nov. 10. By selling the masks, Magness said he hopes to earn enough money to start an experimental hip-hop music group. Magness and Griswold took as many boxes of the masks as they could save – a total of more than 700 masks. Magness said the shipment slips for the masks are dated Sept. 10, 2001, one day before 9/11. Magness said he devoted each day of his performance to one of his multiple personalities called “the Maskure Family.” Magness said he employs the Maskures in selling the masks since certain personalities of his are better geared toward other activities, such as selling balloons in the summer. Each Maskure family member wears a different mask or costume that defines its personality. Magness said he found obstacles on his first day trying to freely express this idea. “The cops kicked me off the first day,” Magness said. 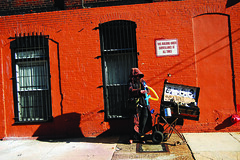 On Liacouras Walk, he portrayed a character of a caring mother called Vulpesmas Reykures, who would ask people to grab their hands, drawing extra attention to himself. The police officers approached the artist, and in the chracter’s long, drawn-out speech, Magness tried to explain what he was doing. “I would not break out of character,” Magness said. Once the officers understood what was going on, they asked Magness to take the items back to his building. Despite the run-in, Magness returned to continue his sales routine with a different character, wearing the mute handmask many people saw that Wednesday afternoon. Most of the money Magness earns from his masks will go toward starting up a music group, he said. But the masks are not a link or symbol of the experimental hip-hop music he said he hopes to produce. Magness said there is a greater message in his masks. “Everyone wears masks and acts differently depending on the person or setting they interact within,” Magness said. He added his dissection of his own personalities and “masks,” acknowledging the different characters in his life. Magness said he believes there is a greater potential in 700 gas masks than just selling them and making money and said he hopes they will eventually be a part of a larger artistic movement. According to Magness, time is art, and if people started looking at life as art, they may appreciate their lives more. “To take raw nature and use one’s energy to transform it into something for utilization or aesthetic is making gold,” Magness said. The TECH Center will soon make 3-D printing available to all students. The group exhibit features projects centered around an assigned object or theme.